The ancient Egyptian Empire is thought to have been established around 3000BC. It continued until 300BC. The ancient Egyptians were a fascinating bunch, with fascinating ideologies and rituals. They ancient Egyptians are also famous for their elaborate clothing. They loved to dress up in extravagant costumes – or nothing much at all – and celebrate. All over the world today people have so much fun dressing up Egyptian-style and mimicking their behaviour. 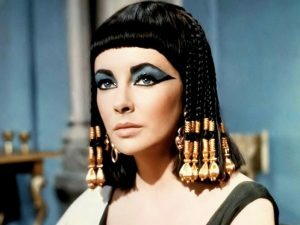 Ancient Egyptians are still influencing pop culture today, as evidenced in many movies and fashion trends. 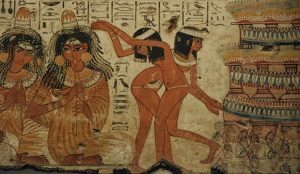 This article takes a look at the history of ancient Egyptian clothing and culture, and some fun ways to bring the Egyptian vibe into your own celebrations. 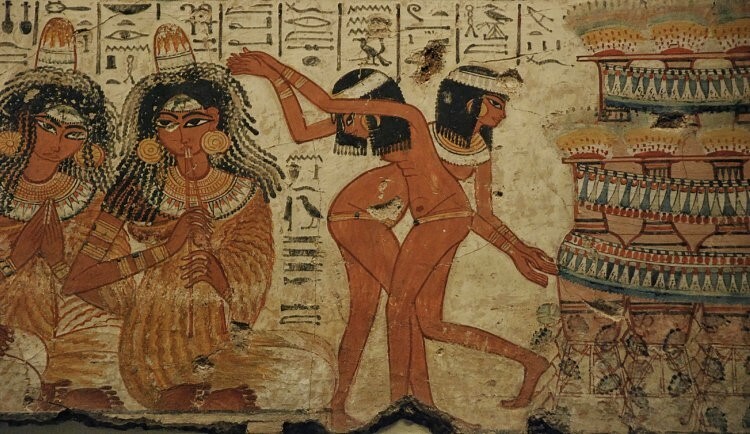 It was the caste system that defined the styles of clothing and costumes that ancient Egyptians are famous for. Slaves didn’t get to wear anything, and the commoner class only had animal skin loincloths and linen spun together from readily available flax fibres. Knee, calf or ankle-length linen kilts and tunics were known as kalasaris and worn by most people from this social class and above. In colder seasons they used wool, and occasionally leather, which was mainly reserved for the privileged castes; the same went for silk and cotton, which came from abroad. Later on shawls became popular. The more affluent Egyptians would let others know it by wearing the thinnest linen sometimes to a point of transparency, if you they were a pharaoh as well as decorative collars and shoulder straps. People were uninhibited and equal rights were the norm; as and when fashion dictated, the women would uncover their breasts. Most Egyptians avoided wearing shoes, but they owned thong-style sandals in case they needed them. It is the Pharaohs and their Queens that usually spring to mind when we picture the ancient Egyptians and their elaborate costumes. Pharaohs wore ornate headdresses and dripped in gold to convey their lofty status. Their jewellery consisted of beads, rings, necklaces and earrings, and would be made from precious gemstones like lapis lazuli and turquoise. Ancient Egypt had at least 29 Kings and Pharaohs, and more than 5 Queens. Some of the best-known, most influential Pharaohs were Akhenaten (Amenhotep IV), Amenhotep, and Tutankhamun; the most memorable females were Cleopatra and Queen Nefertiti. A somewhat bizarre preference of Egyptian women would be to melt a cone of scented fat, which they would spread through their hair. Today’s makeup is heavily influenced by the Egyptians, who loved to wear it regardless of gender or caste. Thick black eyeliner made from black powder was a common sight, as were red ochre (earth pigment) cheeks, and nails and hair were dyed with henna. Egyptian woman also had some of the earliest tattoos in the world. Hair would be cut quite short and kept as straight as possible, and women would decorate their hair with braids, beads and jewellery, sometimes to saturation point! Wigs were an invention of the Egyptians, and the Cleopatra-style wigs people still wear today were very popular. Made of vegetable fibres, wool, or human hair, they would have a different wig for every day of the week! The ancient Egyptians weren’t fans of baldness, so a wig (or scalp decorated in beads) was totally normal for men too. Egypt is home to some of the most fascinating architecture on Earth, and it still draws in crowds from all over the world. The architecture contains many clues as to how they lived their lives and what they believed in. One thing the ancient Egyptians famously did was to mummify their dead, believing that this way the soul could achieve immortality. They were obsessed with cleanliness, feeling that hygiene gave them closer links with the Gods, and they loved to hold religious ceremonies and celebrate life. They would etch images into walls (especially in tombs) depicting their traditions, beliefs, and celebrations. They didn’t like to leave their homeland, and always made provisions to be returned to it if they should die abroad. They loved sports like wrestling, racing, archery, swimming, rowing and sailing; they loved to play board games and were the ones to invent bowling. 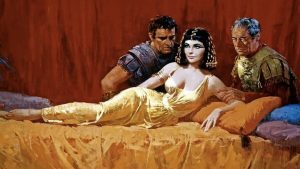 Pop culture is still heavily influenced by the ancient Egyptians, as evidenced in movies like The Mummy, The Gods of Egypt, Helen of Troy, and the fascinating film Cleopatra. Costumes are an absolute must for an authentic Egyptian party. This is your chance to experience the opulence of an Egyptian Pharaoh, or the glamour of a Queen like Cleopatra. Gold and silver, hair braids and beads are all part of the Egyptian look, so go all out on the flamboyant self-decoration. Rhinestones and exaggerated eye makeup, even on the men, will immeasurably enhance your Egyptian prowess. Competitions are always fun and memorable, whether you opt for a costume competition, or one for just Egyptian make-up; you could have a wall art competition, or make your own headdress one. There are lots of opportunities with this theme! Have some board games lying around and stage a game of bowls (or petanque) in the back garden. Creating wall art is lots of fun, competition or not, but obviously you won’t want to destroy your precious wallpaper. Hang a white bed sheet or canvas on the wall, inside or outside in the yard dependent on the weather. You might like the idea of practicing body art on each other, with body paint or even henna if you are brave enough. Print some images of wall art, architecture like the sphinx and pyramids, and some famous Egyptians from the internet and pin them up on walls that makes great inspiration for the wall art too. Lastly, for snacks, almonds, seeds, dried apricots, and golden raisins were popular with Egyptians, and you might want to make an orange cake. Egyptians loved beers, so stock up well on that. That’s it you’re all set to walk like an Egyptian. If your party goes the way many of the ancient ones did, its probably best to keep the photographs in a safe place! Have fun!